Agricultural Glossary of Terms | Anderson Hay & Grain Co. Inc.
Hay is harvested from herbaceous plants that have been cut, dried, and stored for use as animal feed, particularly for animals such as cattle, horses, goats, and sheep (rephrase, directly from Wikipedia). Hay is a harvested plant that has been dried and cured after being cut in the field at various times in its growth period, depending on the type of hay. There are many different categories and types of hay. The main categories are grass hays, legume hays, cereal grain hays, as well as mixed hays (hays that use a mixture of these types). Grass hays have a medium to low protein content while being high in fiber content. Some of the more common grass hays are timothy hay, orchard grass hay, fescue hay, and coastal Bermuda hay. Timothy Hay is grass hay that grows best in a cool season climate. Timothy hay is an exceptional roughage and fiber source. The long stem and consistent quality allows good consumption and provides good conditioning for dairy cows and horses. Timothy has long been thought of as the premier hay for horses, and for many years it has been well known and widely used in the race horse industry. In general, legume hays are higher in protein content and lower in fiber content than grass hays. Common legume hays include alfalfa hay and clover, however alfalfa hay is by far the most widely grown and used legume hay. Alfalfa Hay is a legume hay and is widely used around the world for feeding livestock such as cows, horses, goats, sheep, and other animals. Alfalfa hay is an excellent source of fiber and protein. It is a popular choice around the world for top producing dairy cows, as well as being used in the diet of high performance horses. Horse racing is the sport or activity of racing horses. It is often referred to as “The Sport of Kings”, and is a popular equestrian sport. Horse Racing has a long tradition and has one of the longest histories of any sport. Modern horse races are widely known as some of the most exciting events in all of sports. Show Jumping is an equestrian sport in which riders and their horses compete on course designed to test both the horse and the riders ability to jump and clear course obstacles within a designated period of time. Dressage is the practice of competitive horse training that prepares a horse for pleasure riding and/or competition. There are dressage competitions held at many different levels including the Olympics (dressage is one of the three Olympic equestrian disciplines, along with show jumping and eventing). A hay supplier is a company that specializes in the procurement of hay, manufacturing or processing of hay, and the distribution of hay. Straw is the byproduct of a harvested plant, and is only comprised of the stocks of the plants. Straw is commonly used as it provides a good high fiber roughage and filler in the diet of many livestock. Baled following seed harvest, this high fiber, economically priced roughage is used as livestock feed. Rye Grass Straw, most popular with export beef industry users, is also gaining in popularity with dairy farmers. Fescue Grass Straw is also popular with dairy farmers in the export market and is successfully fed in the beef market. It has a coarser, longer stem compared to Rye. It is also considered very good, economically priced roughage. 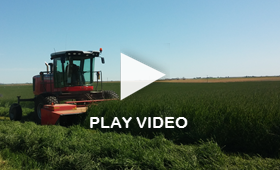 Like Rye and Fescue, Orchard Grass Straw is another very good roughage or filler. It has a coarser stem and is a popular source of fiber in the export market. Blue Grass Staw is a high quality grass straw. It has the highest feed value of all grass straws and is popular in both domestic and export markets for dairy and beef cows. Forageis plant material (mainly plant leaves and stems) eaten by grazing livestock. Historically the term has meant only plants eaten by the animals directly as pasture, crop residue, or immature cereal crops, but it is also used more loosely to include similar plants cut for fodder and carried to the animals, especially as hay or silage. Equus is a genus of animals in the family Equidae that includes horses, donkeys, and zebras. Within Equidae, Equus is the only extant genus. Like Equidae more broadly, Equus has numerous extinct species known only from fossils. This article deals primarily with the extant species. The term equine refers to any member of this genus, including any horse. The word comes from Latin equus, "horse", cognate with Greek "ἴκκος" (ikkos), "horse" (the earliest form of the word is the Mycenaean Greek i-qo, written in Linear B syllabic script). Equines are medium to large mammals, with long heads, and necks with a mane. Their legs are slender and end in a single, unguligrade toe, protected by a horny hoof. They have long, slender, tails, either ending in a tuft, or entirely covered in flowing hair. They are adapted to generally open terrain, from plains and savannas, to mountains or deserts.